This is a new FM pll 10Mhz - 600Mhz with MB1501 pll chip, for WFM use with steps resolution 25Khz and 250Khz or for NFM use with step resolution12.5 or 10 or 5Khz. This pll programming from me to freq. band who you want. Have up down , and step select. the last freq. go to memory automatic. 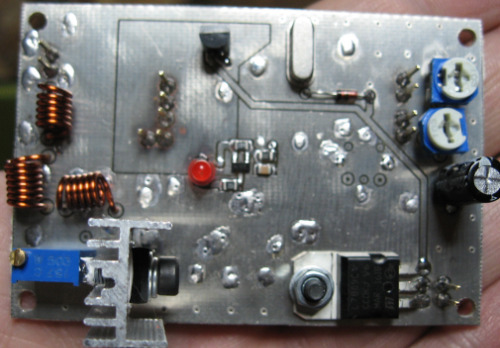 Rf power output 1W with variable circuit 10mW-1W at 50ohm (the uhf versions the max.output is 500mW). With protection circuit no rf output if not lock.clear sound. with low noise mosfet oscillator. 7 pole low pass filter to output >60DB. Excellent device for broadcast transmit or link use or repeater transmit. For 500mW version please contact me. For narrow mode please contact me. For other informations for your project please contact me. After order please contact me for band who you want to transmit for i make it.